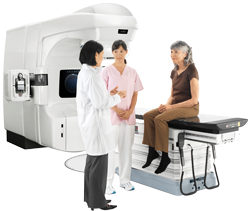 There are two basic types of radiation treatment: radiotherapy and radiosurgery. With both techniques, treatment delivery is noninvasive, so there are no incisions. These techniques focus a beam of radiation directly to the tumor while minimizing exposure to surrounding healthy tissue. The main differences between the two techniques are the number of treatment sessions and the strength of each dose of radiation given. Radiotherapy usually involves having treatment sessions five days a week for four to six weeks, with each treatment session lasting about 2 to 15 minutes. Radiosurgery is delivered in five or fewer sessions over one or two weeks, with most treatment delivery taking from a few minutes to 30 minutes. Also, the strength of each dose is much higher in radiosurgery, which makes it more appropriate for treating deep-seated tumors, smaller tumors, and cancers that have spread (metastases) to multiple locations in the body. Three-dimensional conformal radiotherapy (3DCRT) involves taking detailed digital images of a tumor and the surrounding normal structures (bones, organs, etc.) to deliver highly “conformed” (focused) radiation to match the shape of a tumor. Intensity-modulated radiotherapy (IMRT) and intensity-modulated radiosurgery (IMRS) allow doctors to adjust the intensity of a radiation beam so that the tumor receives a very high dose of radiation while minimizing exposure to normal tissue. Your clinical team uses three-dimensional scans of the target site to visualize the treatment “field” from many different angles. At each of these angles, the intensity of the radiation beam is modulated and the shape of the beam is changed to match the shape of the tumor. When this technique was introduced in the early 1990s, it was considered to be a major advance in the treatment of cancer. Today, this technique is being used by most treatment facilities in North America. Image-guided radiotherapy (IGRT) and Image-guided radiosurgery (IGRS) enables your clinical team to visualize a tumor’s position before and during treatment, which is especially important when treating the chest or abdomen, areas in which the tumor may move when you breathe. IGRT and IGRS use advanced imaging techniques and motion management technology to verify the exact position of the tumor at the moment of treatment. Volumetric arc therapy (VMAT) is an advanced form of radiation treatment introduced by Varian Medical Systems, also called RapidArc® radiotherapy technology. RapidArc is a special kind of software that can be used with an advanced linac to deliver IMRT treatments quickly. With conventional IMRT treatments, a typical treatment can take anywhere from 15 minutes to 30 minutes. With RapidArc, most treatments can be delivered in less than two minutes. SRS, or stereotactic radiosurgery, is a type of radiosurgery that refers specifically to the treatment of tumors or other abnormalities in the brain and spine. When radiosurgery technology is used to treat parts of the body outside of the central nervous system, it is called stereotactic body radiotherapy (SBRT). SBRT is most often used to treat the prostate, lungs, pancreas or kidneys. Because the intensity of each dose is much higher with radiosurgery, it is not appropriate for all cancer types. Your clinical team will determine the most appropriate way to treat your cancer.